Gasp! That's Sugar Boy from SitS! But in BatB style!! I was just about to say this! He is my favorite! Have the windows pins been available for sale outside of the park (if so, where?) and would this change if a wristband rule is put in place? I've been offline pretty much all today so I've missed all the good April Fools Day stuff. What were the characters in the fake flip? 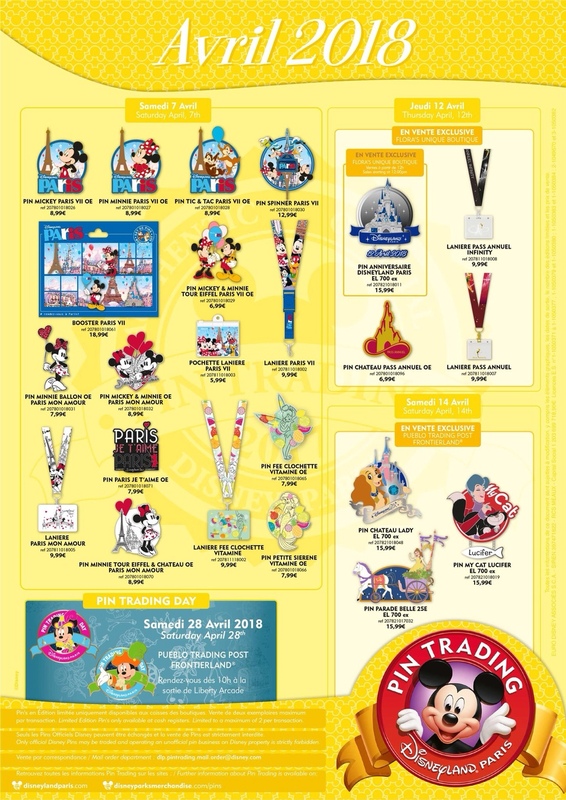 New April flyer for Disneyland Paris is out! TinyTink, mickeymousje, krand1276 and 3 others like this. Umm, I need that chip and dale and Ariel pin. Can anyone please do pickups? Thanks! Spr175psu and MerlinEmrys like this. The Belle pin is pretty, but what happened to her horse? Rucifee!!! Oh, he's so cute! Must be trying to describe those fruits on the pins??? Oooh they made a Lady pin! Yes at DTD Pin Traders, but their hours are unpredictable, I missed it last week cause they opened at 7, when normally it was 10, There might be others, I just haven't found them yet. Usually wristbands are advised on the flyer, since there hasn't been one lately we'll have to see how it'll work out and/OR they'll let us know when we try to buy them, that we needed a wristband. Disney usually has a disclaimer that it's subject to change, which is their Out if something goes wrong or differs from the norm. Spr175psu and krand1276 like this. That healthy vitamin infused Ariel calls to me! Maybe even Tink, too. Add me to that list of folks interested in them for a pickup. arielsdinglehopper, Jack Skellington, DitzyDreamer and 1 other person like this. Thank you both so much! I'll definitely have to PM you! There's nothing my wife loves more than Eiffel Tower and Chip&Dale so it's the absolute perfect pin for her collection. mickeymousje, MerlinEmrys and arielsdinglehopper like this. Is there any way to know what time the DTD store(s) will open for Ursula WofE? Seems like spring break should be over by now. It should be over. I'll find out and update here. Some schools around here are still on break through the end of this week.